The Autism Speaks Awareness Pack (ASAP). Click the image to download. MANILA, PHILIPPINES (1 April 2014): The leading voice of self-advocacy in the Philippines is expected to have a change of heart this year, as it has confirmed today that it is Asia’s official representative of America’s biggest autism organization. BigBroBlogs LLC, the Philippines-based holding company of the Autistic BigBro blog, and Autism Speaks Inc., based on Washington, DC, has signed a memorandum of understanding at an undisclosed location, naming blogger and autistic self-advocate Gerard Joseph Atienza as Autism Speaks’s Official Mouthpiece for Asia and the Pacific. Under the terms of the agreement, in exchange for increased traffic, online revenue, and concessions for travel and everyday expenses, Mr Atienza will refrain from publishing blog posts that do the following: undermine the agenda of Autism Speaks; promote autistic acceptance and self-advocacy; and empower parents, professionals, and autistics; practices that the Autistic BigBro blog has been known to consistently apply to every blog post. Instead, blog posts will deal on the new 3EAs campaign of Autism Speaks: Eradication of Autism, the Exclusion of Autistics, and Extermination of Autistics. In addition, in observance of Autism Speaks’s Light It Up Blue campaign, the site will be required to switch from its black-and-white theme, a normally accessible theme, to hues of blue, despite it being overbearing to many persons with autism. 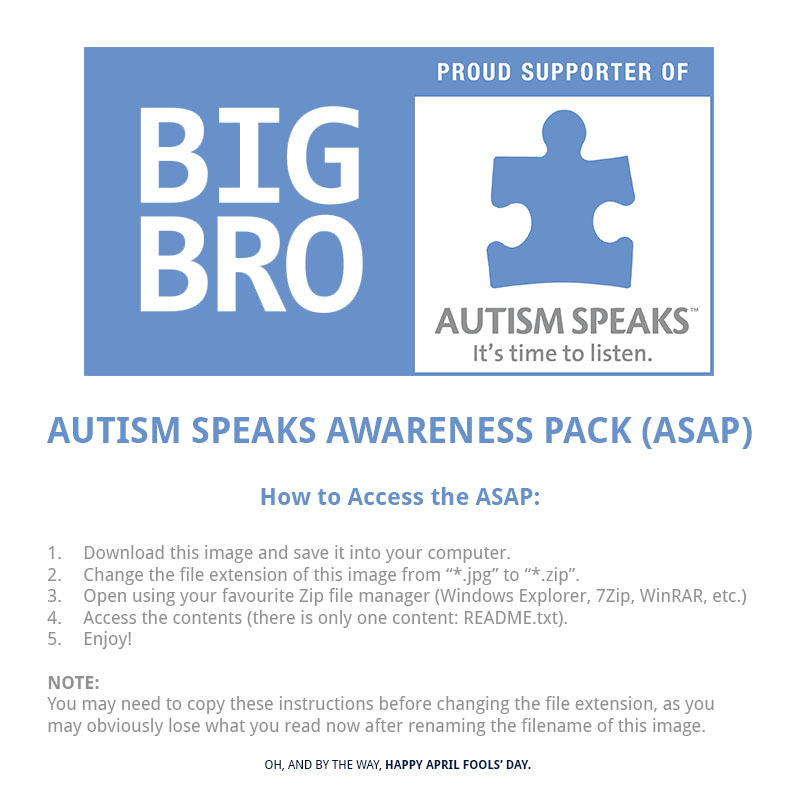 To celebrate this change, Autistic BigBro is launching the Autism Speaks Awareness Pack (ASAP), a comprehensive toolkit of links that aim to give the public more than ample information on Autism Speaks and what it has been doing since its inception. BigBroBlogs LLC is the holding company who owns and maintains the Autistic BigBro blog and its associated social networks. Mr Atienza is its Proprietor and Chief Blogger. Oh, and by the way, Happy April Fool’s Day. There’s no way I’m ever going to support those hypocritical bigots and their eugenic and fear-mongering propaganda. OMG, Gerard! I almost had a heart attack when I was reading this. I was so relieved to find out this was an April Fool’s Day joke! Hahaha. Good one! You have a great sense of humor! It was really great to finally meet you! Hope to see you again very soon.